Eugene city located in the U.S. state of Oregon and is situated 80 kilometers away from the Oregon Coast. 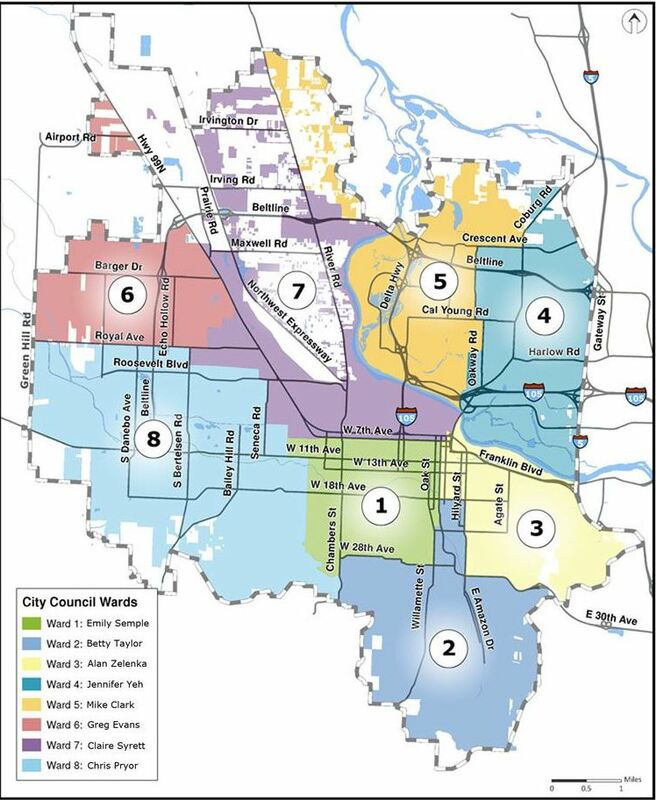 Eugene has 23 nearby neighbor associations Amazon, Bethel, Cal Young, Churchill, Crest Drive, Downtown, Fairmount, Far West, Friendly, Goodpasture Island, Harlow, Industrial Corridor, Jefferson Westside, Laurel Hill Valley, Northeast, River Road, Santa Clara, South University, Southeast, Spencer Butte, Trainsong, West Eugene, West University, Whiteaker. The city is full of art galleries and museums as Museum of Natural and Cultural History, Lane County History Museum, Shelton McMurphey Johnson House, the University of Oregon's Jordan Schnitzer Museum of Art and the Oregon Air and Space Museum, Maude Kerns Art Center, and the Eugene Science Center. Eugene hosts numerous other cultural organizations as the Eugene Ballet, the Eugene Symphony, the Eugene Concert Choir, the Eugene Opera, the Oregon Mozart Players, the Northwest Christian University Community Choir, the Oregon Children's Choir, Ballet Fantastique and Oregon Festival of American Music, the Oregon Bach Festival, the Eugene-Springfield Youth Orchestras. The John G. Shedd Institute for the Arts ("The Shedd"), Matthew Knight Arena, the Hult Center for the Performing Arts, the McDonald Theatre, W.O.W. Hall, Beall Concert Hall, and the Erb Memorial Union ballroom on the University of Oregon campus are major performing art venues of the state and offer some concerts and exhibitions on the constant basis. The Oregon Contemporary Theatre, Free Shakespeare in the Park, Actors Cabaret, the Very Little Theatre, Rose Children's Theatre, LCC Theatre, and University Theatre have their performance venues as well and are entirely known within the United States. Eugene is home to music bands and various music styles starting from electronic dance music and ending with the heavy metal. The Cherry Poppin' Daddies became the prominent figure of the Eugene music industry and had the regular concerts and gathering at the Eugene's W.O.W. Hall. The band YOB became one of the leaders in the heavy metal music flow. Kutsinhira Cultural Arts Center is based in Eugene and is dedicated to the Zimbabwean music community. The city supports young artists and painters; therefore, 20 private art galleries host regular exhibitions. Among those, there are Lane Arts Council, DIVA (the Downtown Initiative for the Visual Arts), Maude Kerns Art Center, and the Eugene Glass School. Among the recreational sites of the city, the one may highlight the Spencer Butte Park that offers direct access to the Spencer Butte. Hendricks Park is located east from the downtown and is known as the place where the famous runner of the University of Oregon was killed in an auto accident. The Owen Memorial Rose Garden located next to the Willamette Valley is known for its 4.500 roses of over 400 varieties as well as the 150-year oak tree growing there. The Willamette Pass, the nearest ski resort, is located in a one-hour ride and is on the way to the Willamette National Forest that has mountain bike trails, hot springs, and waterfalls on its territory. Among the famous ski resorts, there are also Hoodoo and Mount Bachelor available in the nearest access to Eugene as well. The city is the second most populous city after Portland in the Lane County. The population of the town has reached about 156.185 people in 2010 and 160.561 people in 2014. The Eugene-Springfield, Oregon metropolitan statistical area (MSA) is the third-largest area of the state and the 146th-largest area of the United States. The city hosts the University of Oregon and the Lane Community College, established in 1876 and 2014 relatively. The town is also known for its environmental and natural development; therefore, Eugene was named as ‘Emerald City' and ‘Track Town, USA.' Notably, public corporation Nike has its roots in Eugene city. The total area of the city covers about 113.29 square kilometers, 113.23 square kilometers of which are covered by land and only 0.05 square kilometers by water. Eugene is located 130 meters above the sea level. The Skinner Butte hill which is located to the north of the city downtown and was named after the founder of Eugene - Eugene Skinner. The Coburg Hills found northeast of the city is represented a range of foothills of the western Cascade Range of Lane and Linn counties in Oregon, USA. The Spencer Butte landmark located south of the city is considered the tallest point of the town when looking from the city downtown. The Mount Pisgah found southeast of the city is rising 320 meters above the Willamette Valley and consists of the Mount Pisgah Arboretum and the Howard Buford Recreation Area. The central part of the city revenue comes from the wood products manufacturing and recreational vehicle manufacturing. Among Eugene's largest employers there are PeaceHealth Medical Group, the Eugene School District, and the University of Oregon. Willamette and McKenzie's rivers are running through Eugene and its nearby city Springfield. Another river Amazon Creek that starts from the Spencer Butte divides the west of the town from the rest of Eugene. The Fern Ridge Reservoir situated on the Long Tom River is maintained for the winter flood control by the Army Corps of Engineers. The Fern Ridge Reservoir hosts the sailing regattas managed by the Eugene Yacht Club that offers all types of a sailing school services.